SPIND™ FLOOR GULLY/TRAPS AND PREZIT™ JOINT FITTINGS represent a revolution in the construction of bathrooms drainage and portable water supply systems. Highly innovative and made to various standard specifications, the ingenious floor gully/traps allow for direct embedding on the floor, and at the same time, allow for easier top access during cleaning and maintenance. 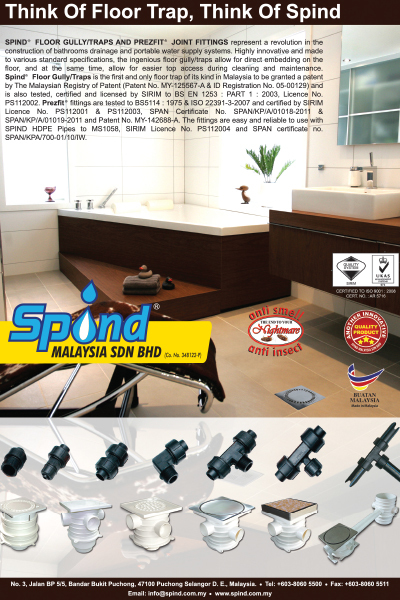 Spind™ Floor Gully/Traps is the first and only floor trap of its kind in Malaysia to be granted a patent by The Malaysian Registry of Patent (Patent No. MY-125567-A & MY-143404-A) and is also tested, certified and licensed by SIRIM to BS EN 1253: PART 1: 2003, Licence No. PS112002. Prezfit™ fittings are tested to BS5114: 1975 & ISO 22391-3-2007 and certified by SIRIM Licence No. PS112001 & PS112003, SPAN Certificate No. SPAN/KPA/700-1/14/18 & SPAN/KPA/700-1/14/18A and Patent No. MY-142688-A. The fittings are easy and reliable to use with SPIND HDPE Pipes to MS1058, SIRIM Licence No. PS090103 and SPAN certificate no. SPAN/KPA/700-01-10/IW.